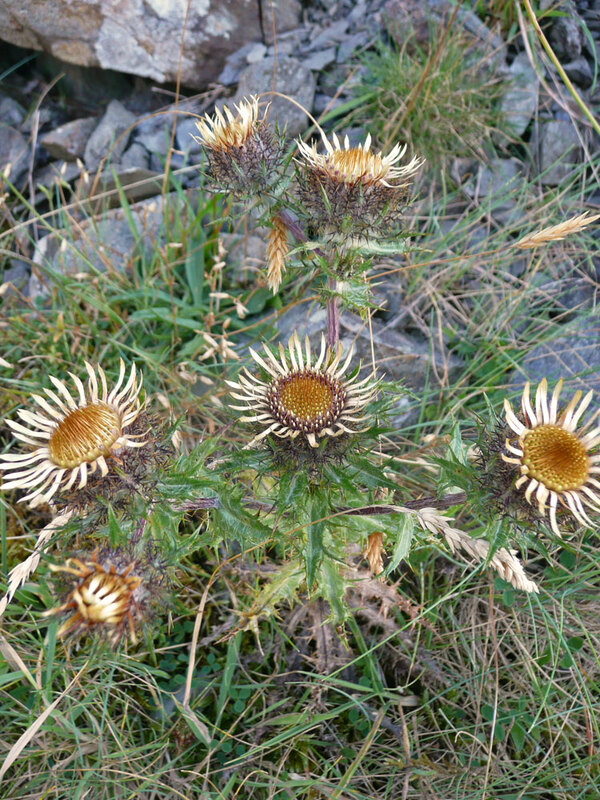 Carline thistle is a short, stiff and exceptionally spiny plant with a brownish yellow flower–head surrounded by straw coloured, petal like bracts. Although they flower from mid summer to early autumn the dead flowers retain the same appearance and can often be found well into the winter. 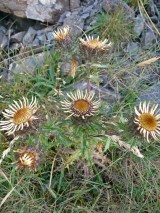 Carline thistle is a native monocarpic perennial (the plant dies after flowering) of well-grazed, dry, infertile and calcareous or base-rich soils. Its flowers are pollinated by bees, butterflies and moths or it can fertilize its self if needs be. The resulting seeds are distributed by the wind and need a short and open sward if they are to establish successfully. The seed is capable of immediate germination, however, in the wild it germinates in late summer or early spring and so an autumn or early spring sow might be best.